"We carefully listened to feedback from our fans and retail partners and are pumped to showcase our new brand and packaging that make eating an awesome, high-protein food even easier." ProYo can’t stop innovating! The first company to deliver 20g of protein in 4oz of delicious frozen yogurt is unveiling new packaging and branding for its awesome protein powered products at Natural Products Expo West 2016. Founded by Nathan Carey in 2013 on the idea that big protein could fit into a small, delicious package, the new look boldly answers millennials’ demand for brands with a vibrant personality and convenient, on-the-go packaging. While the outside will evolve, the already loved ingredients, tasty flavors and superior nutritional benefits of ProYo Frozen Yogurt will remain the same. A hint to future innovation. A sleek new trademark and logo that not only hints at the original innovation behind the brand, but also speaks to the company’s future by de-emphasizing the "yo," as ProYo plans to expand beyond yogurt-based products into new categories. Ingredient Focus. The new packaging is exceptionally clean and refreshing and emphasizes the premium ingredients, amazing taste, and dense nutrition shoppers already rave about. ProYo Frozen Yogurt is available in four delicious flavors, including Premium Dutch Chocolate, Premium Blueberry Pomegranate, Premium Vanilla Bean and Premium Banana Vanilla. Made with cultured probiotic yogurt, each serving of ProYo delivers superior nutrition, including 20g of protein, a daily serving of leading probiotics, only 140-calories and 2g of fat, and is a good source of fiber. All ingredients are also certified gluten-free, soy-free, non-GMO and diabetic-friendly. Convenience and versatility. 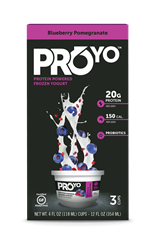 ProYo can now be purchased in three-pack cartons (MSRP $6.99), and soon single-serving cups or tubes (MSRP $2.49) will be available. The single-serving tubes, which now feature the new logo and branding, are perfect for immediate enjoyment and base for a smoothie. Debuting at Expo West, the new ProYo Frozen Yogurt single-serving cups are perfect for creating a breakfast bowl packed with protein. The usage occasions for ProYo are endless! Whether enjoyed as a breakfast staple, on-the-go snack, recovery fuel post workout, or as a side to liven up a lunchbox, ProYo delivers protein packed awesomeness in every bite! Fitness enthusiast Nathan Carey created ProYo after suffering a devastating weightlifting accident. Unable to eat with both hands, but in need of protein for recovery, Nathan reached for shakes and bars. Disappointed by the sugar and stabilizers in these products, Nathan was inspired to leverage his entrepreneurial background in frozen yogurt to create a high-protein snack with balanced nutrition, amazing taste and no gunk. The winning result? Carey developed an innovative process that allows for dissolving large amounts of protein into small amounts of liquid, creating a protein-packed amazing food that delivers 20g of protein in a small but mighty 4oz serving of delicious probiotic yogurt. Compared to other protein shakes and bars, this dense powerhouse of nutrition tastes like creamy ice cream, and has no grainy or chalky taste or residue. ProYo Frozen Yogurt is available in the Western U.S. at leading retailers such as Whole Foods Market, Safeway, Von’s/Pavillions, Gelsons, Bristol Farms, Mother’s Market, and on military bases nationwide and in Europe. ProYo is experiencing unit sales 3-4 times the category average in its lead markets, and is positioned to grow by more than 500% in 2016. Through a recent addition of an executive management team and a partnership agreement with Natural/Specialty Sales, a division of Acosta, ProYo is quickly expanding across the U.S., with exciting new retail partners including Shaws in New England and Harmons Grocery in Utah. Shoppers can find ProYo Frozen Yogurt in the freezer aisle merchandised next to novelty products or in the smoothie door section. To find a full list of stores, visit the ProYo store finder online at http://proyos.com/where-to-buy/. To learn more about ProYo, buyers are invited to visit the company’s booth in Hall E #5187 at Expo West. More information can also be found online at http://www.proyos.com, and by connecting to the brand @ProYoTreats on Facebook, Twitter and Instagram. ProYo, based in Santa Barbara, Calif., was founded on the belief that healthy living is a foundation for a fun and rewarding lifestyle. ProYo Frozen Yogurt delivers PROTEIN POWERED AWESOMENESS, balanced nutrition, convenience, and above all, amazing taste. Crafted from creamy, high-protein probiotic yogurt and all-natural fruit, ProYo Frozen Yogurt is a delicious and nutritious snack loaded with category-leading 20g of protein per serving. ProYo is also low fat, a good source of fiber, GMO-free, gluten- and soy-free, rBST- and rBGH-free, and contains no artificial flavoring or preservatives. Enjoy a ProYo on-the-go, or as a smoothie base, lunchbox staple or post workout fuel. Simply ProYo and Go! Visit proyos.com to learn more, and engage with the brand at @ProYoTreats on Facebook, Twitter and Instagram.